Dress: 3.1 Philip Lim for Target Knit Dress- Animal Print, here. Steal: 3.1 Philip Lim for Target Knit Dress- Animal Print, here. 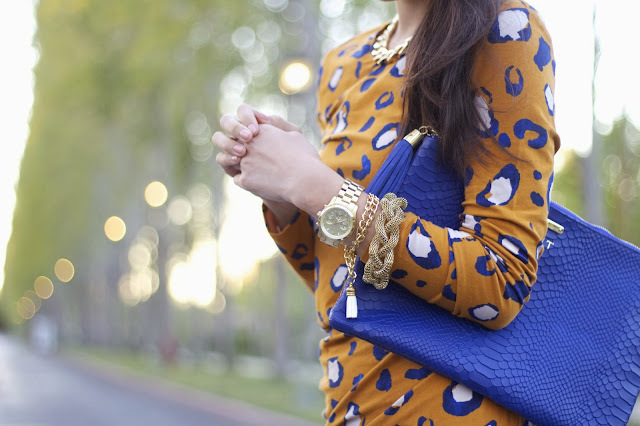 Splurge: 3.1 Philip Lim Sculpted Leopard Print Dress from Nordstrom, here. Necklace: Polished Chain Link Necklace thanks to DailyLook, here. Steal: Hammered Metal Rolo Chain Necklace from Forever 21, here. Splurge: Polished Chain Link Necklace from DailyLook, here. Steal: Modernist Chain-Link and City Chic Tassel Bracelet from Forever 21. Splurge: White Alyssa Tassel Bracelet from Cathryn Ann, here. Chunky Link Bracelet from Nordstrom, here. Clutch: Indigo Uber Clutch thanks to GiGi New York, here. Steal: Classic Oversized Faux Leather Clutch from Forever 21, here. Splurge: Indigo Uber Clutch thanks to GiGi New York, here. Steal: Timeless Faux Suede Platforms from Forever 21, here. Splurge: Penny Loves Kenny 'Katherine' Pump from Nordstrom, here. Don't forget to check out and enter into my giveaway with Glamour Me Jewels! THE LIST has 3 different bags- the Starter ($59), SoHo ($129), and St. Barth's ($389). I got the SoHo bag which included the tulle skirt I am wearing by Space 46, Caroline Gardner notebook, Blithe & Bonny soap bar, and Herban Essentials towlettes. If you are considering joining a program similar to THE LIST by I-ELLA, I recommend considering them because I absolutely enjoyed my first gift bag. Top: Sequined-Dot 3/4 Sleeve Tee from Old Navy, here. Steal: Sequined-Dot 3/4 Sleeve Tee from Old Navy, here. Splurge: Sequin Dot Tee from Banana Republic, here. Skirt: Wendy Tulle Skirt by Space 46 Boutique thanks to iELLA, here. Steal: Ten Sixty Sherman A-Line Skirt from Nordstrom, here. Splurge: Wendy Tulle Skirt by Space 46 Boutique, here. Steal: Halogen Faux Patent Gold Belt from Nordstrom, here. Splurge: Astor Hip Belt with Straight Metal Tip by Linea Pelle, here. Necklace: Nottingham in chalk thanks to Tryst Jewellry, here. Steal: Bejeweled Bib Necklace from Forever 21, here. Splurge: Nottingham in chalk from Tryst Jewellry, here. Bracelets: Red Alyssa Tassel Bracelet thanks to Cathryn Ann, here. Steal: Chain Toggle Bracelet from Forever 21, here. Splurge: Red Alyssa Tassel Bracelet from Cathryn Ann, here. Rings: Bubble in Opal thanks to Tryst Jewellery, here. Triangle and Heart Ring thanks to Madi & Bee Co. Steal: Dainty Scalloped Ring, Twisted Heart & Arrow Open Ring, and Geo Ring from Forever 21. Splurge: Bubble in Opal from Tryst Jewellery, here. Triangle and Heart Ring from Madi & Bee Co.
Earrings: Roundabout Petite thanks to Tryst Jewellry, here. Steal: Classic Knotted Studs from Forever 21, here. Splurge: Roundabout Petite thanks to Tryst Jewelry, here. Clutch: Sparkling Gold Clutch thanks to Benevolent Jewels, here. Steal: Sparkling Gold Clutch from Benevolent Jewels, here. Splurge: Sequined Foldover Clutch from Forever 21, here. Shoes: Anne Michelle Perton-17 Ankle Strap Sandal thanks to ZOOSHOO, here. Steal: Anne Michelle Perton-17 Ankle Strap Sandal thanks to ZOOSHOO, here. Splurge: Sole Society Aubrey Sandal from Nordstrom, here. TGIF! :D If you have not already, check out my new giveaway with Glamour Me Jewels for a chance to win a $25 gift certificate to their store! Also, congratulations to Ron for winning my Polette giveaway! The other day, we took Mochi, my 4 year old German Shepherd that I adore, to Petsmart for his regular shower and they forgot the bathe him! :( My poo baby was locked up in a cage for 4 hours. Mochi is a big dog and it boggles my mind how they could book him an appointment for a bath and then totally forget to bathe him. When we brought him home, he was really thirsty and really had to use the restroom. We've never had an issue like this with Petsmart before, but this was very upsetting and we're definitely not going to go back there. :( So FYI for all of my pet lovers, don't let that happen to your pet! Jacket: Cute Black Blazer thanks to Lulu's, here. 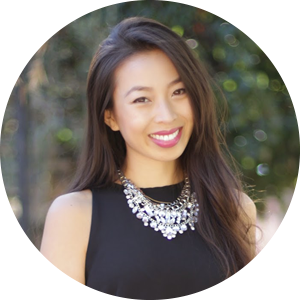 Steal: Cute Black Blazer from Lulu's, here. Splurge: Halogen Jacquard One Button Blazer from Nordstrom, here. Top: Chambray Top from Old Navy, here. Steal: Chambray Top from Old Navy, here. Splurge: 1969 Asymmetrical Pocket Polka Dot Denim Shirt from Gap, here. Steal: Zipper-Trimmed Skinny Pants from Forever 21, here. Splurge: Jolt Zipper Detail Twill Pants from Nordstrom, here. 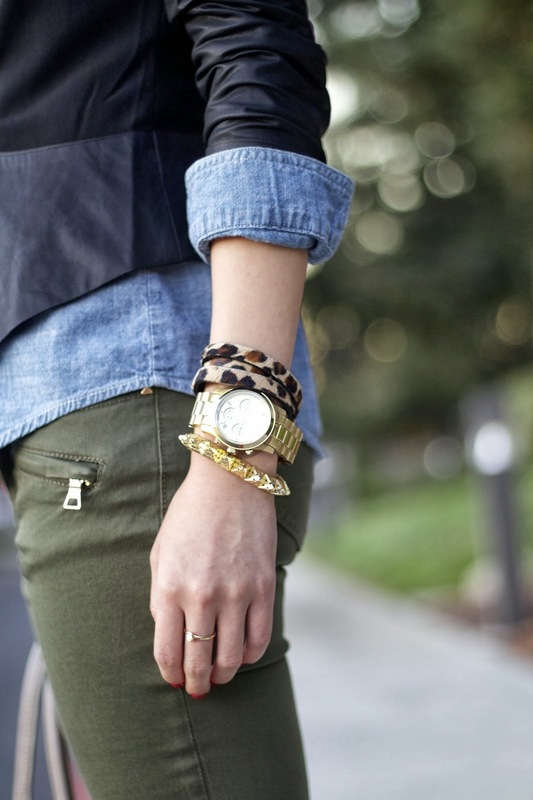 Bracelets: Kim in Leopard and Ryanna thanks to Thesis of Alexandria. Steal: Leopard Wrap and Spikes & Pearls Bracelet Set from Forever 21. Splurge: Kim in Leopard and Ryanna from Thesis of Alexandria. Necklaces: Autography Plate and Initial Here Necklace thanks to Taudrey. Speckled Turquoise Mini Olivia Necklace thanks to eft.Y.bee. 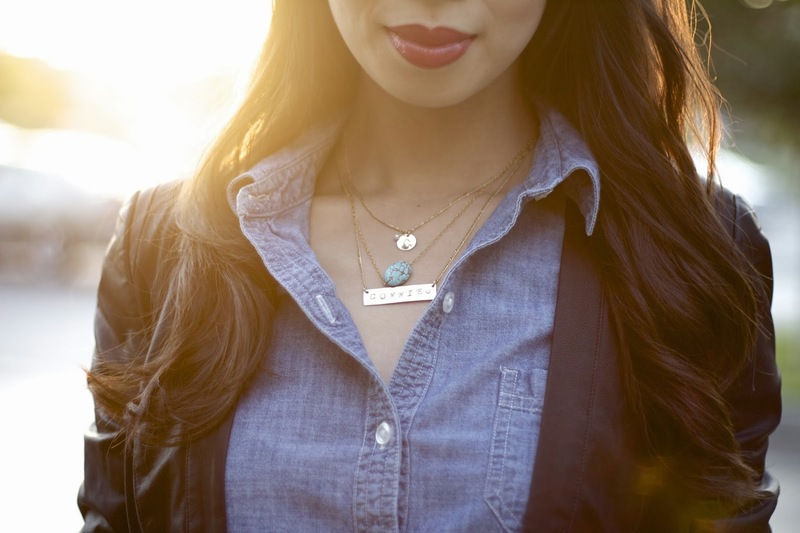 Steal: Faux Stone Teardrop, Get Lucky, and C Initial Pendant Necklace from Forever 21. Splurge: Autography Plate and Initial Here Necklace thanks to Taudrey. Speckled Turquoise Mini Olivia Necklace thanks to eft.Y.bee. Watch: Golden Midsized Chronograph Runway Watch by Michael Kors, here. Steal: Classic Oversized Watch from Forever 21, here. Splurge: Golden Midsized Chronograph Runway Watch by Michael Kors, here. 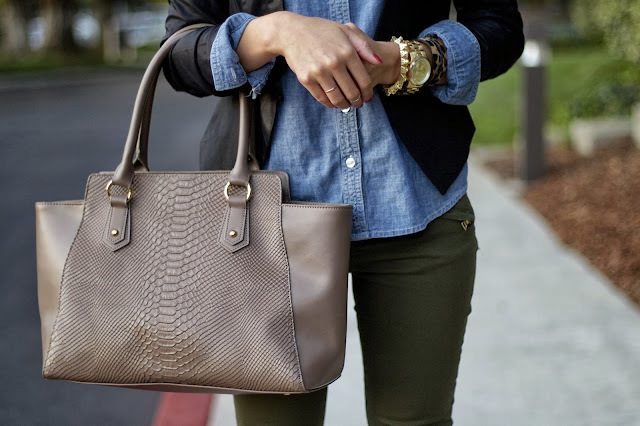 Purse: Musette Carryall Tote thanks to Cuore and Pelle via /excelamktg, here. Steal: Musette Carryall Tote from Cuore and Pelle, here. Splurge: MARC BY MARC JACOBS 'Too Hot To Handle' Bentley Leather Tote from Nordstrom, here. Shoes: Anne Michelle Momentum 39 Black Suede and Mesh D'Osray Heels thanks to Lulus.com, here. Steal: Anne Michelle Momentum 39 Black Suede and Mesh D'Osray Heels from Lulus.com, here. Splurge: Sole Society Elisa Pump from Nordstrom, here. I wore this pairing to the airport over this past weekend when we flew to Los Angeles for a couple birthday parties. On the surface, I loved the casual, simple, and chic feel of a tank, jeans, and heels, but one aspect that I overlooked for my trip to the airport are that these lace up heels are a pain to take off and put on. So as we went through the TSA security screening at the airport, I held up the line... sorry! >_< But besides being hard to put on and take off, these heels are one of my favorite items in my closet! I have a new exciting giveaway that starts today- it is with the jewelry brand Glamour Me Jewels, they sell trendy and colorful items that will glam and brighten up your accessories! Glamour Me Jewels is so generous to allow me to host a giveaway where one of my lucky readers can win a $25 gift certificate to their store! I have their Kelsi pave bracelet in silver and have styled with it a couple of times on my blog, see here and here. Here is a photo of my Kelsi bracelet from my Red & Pink post. 1. Like Glamour Me Jewels on Facebook, here. 2. Follow me on Bloglovin, here. 3. Leave a comment below with your name, email address, and your Bloglovin username. All 3 steps must be completed in order to qualify for this giveaway. Entries will be accepted until October 1st at 12:00 AM PST and is open to all US residents. One winner will be randomly selected and notified via email. Good Luck! Top: Tank with Contrast Tier thanks to LE TOTE, here. Steal: Essential Floral Lace Top from Forever 21, here. Splurge: Lush Lace Trim Tank from Nordstrom, here. Steal: Cropped Blue Distressed Skinny Jean from GJG Denim, here. Splurge: The Skinny with Squiggle Skinny Jeans by 7 For All Mankind, here. Necklace: The Chevron Necklace in Long thanks to Wild Butterfly Boutique, here. Steal: Statement by DCK Chevron Layering Necklace from Nordstrom, here. Splurge: The Chevron Necklace in Long from Wild Butterfly Boutique, here. Rings: Bubble in Opal Ring thanks to Tryst Jewellery and Heart Ring thanks to Madi & Bee Co. Steal: BP. Rhinestone Midi Ring from Nordstrom, here. Heart Ring from Madi & Bee Co., here. Splurge: Bubble in Opal Ring from Tryst Jewellery, here. Arrow Wrap Ring from Gorjana Griffin, here. Clutch: Trouve Croc Embossed Metal Clutch from Nordstrom, here. Steal: Python Box Clutch from DailyLook, here. 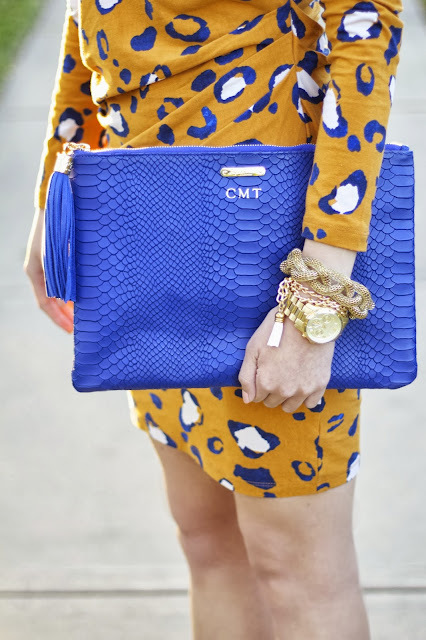 Splurge: Trouve Croc Embossed Metal Clutch from Nordstrom, here. I wore this outfit a couple of nights ago when a couple of girlfriends and I grabbed our weekly dinner, we usually get yummy sushi. ;) On the surface, this outfit is very simple. It is a lace top with a skirt, but with the skirt being leather and a breathtaking olive green, it was fitting for the changing weather. I got my skirt and heels from Lulu's and am really exciting to share with you that I'm collaborating with them, so look out for upcoming pairing featuring their items! Steal: Lace Cap Sleeve Top from Forever 21, here. Splurge: ASTR Lace Tee from Nordstrom, here. Skirt: Happily Leather After Olive Green Vegan Leather Skirt thanks to Lululs.com, here. Steal: Lily White Skate Skirt from Nordstrom, here. Splurge: Happily Leather After Olive Green Vegan Leather Skirt from Lululs.com, here. Belt: Mya Waist Belt thanks to Linea Pelle, here. Steal: Metallic Bow Waist Belt from Forever 21, here. Splurge: Mya Waist Belt from Linea Pelle, here. Necklace: Gold Medusa Necklace thanks to Citizen Mod, here. Steal: Stephan & Co. Twisted Snake Chain Necklace from Nordstrom, here. Splurge: Gold Medusa Necklace from Citizen Mod, here. Ring: Lana Ring thanks to Robyn Rhodes, here. Steal: Ariella Collection Open Ring from Nordstrom, here. Splurge: Lana Ring from Robyn Rhodes, here. Bracelets: Trish and Ryanna thanks to Thesis of Alexandria. 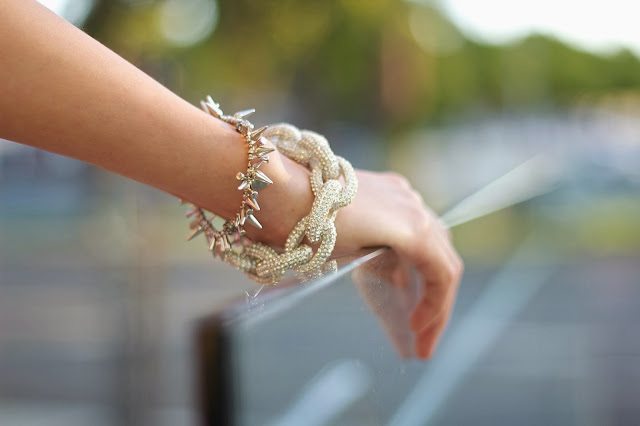 Steal: Spiked Cuff and Rope Chain Bracelet from Forever 21. Splurge: Trish and Ryanna from Thesis of Alexandria. Watch: Michael Kors Yellow Golden Midsized Chronograph Runway Watch, here. Steal: Titanium Rhinestone Boyfriend Watch from Nordstrom, here. Splurge: Michael Kors Yellow Golden Midsized Chronograph Runway Watch, here. Steal: Urban Expressions Handbag Snake Embossed Clutch from Nordstrom, here. 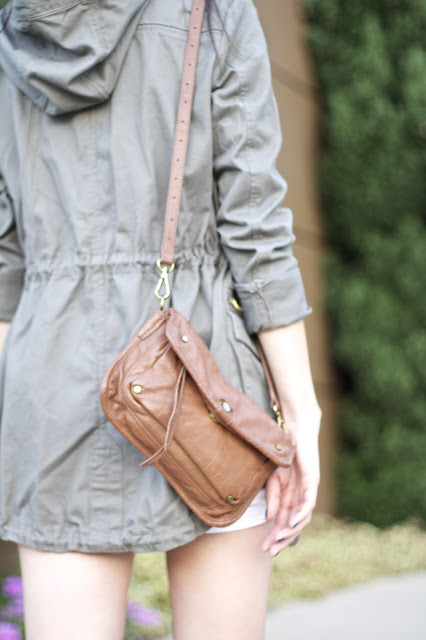 Splurge: Grayson Top Handle Crossbody Handbag from Linea Pelle, here. TGIF everyone! I hope everyone has a wonderful and an eventful weekend! Don't forget to check out my giveaway, today is the last day to enter! Dress: Candy Tunic thanks to Tart Collections, here. Steal: V-Back Bodycon Dress from Forever 21, here. Splurge: Candy Tunic from Tart Collections, here. Necklace: Max Chloe Necklace in Matte Gold thanks to Happy Wrist, here. Steal: Crystal Wreath Statement Necklace from DailyLook, here. Splurge: Max Chloe Necklace in Matte Gold from Happy Wrist, here. Ring: Lucas Ring thanks to Robyn Rhodes, here. Steal: Stretchy Faux Stone Ring from Forever 21, here. Splurge: Lucas Ring thanks to Robyn Rhodes, here. Wedges: Lisa Wedges in Gold from Shoe Dazzle, here. Steal: Lisa Wedges in Gold from Shoe Dazzle, here. Splurge: Anne Michelle Momentum 39 Gold and Mesh D'Osray Heels from Lulu's, here. Nail Polish: Azzurrum thanks to LVX, here. I took these photos when I was down in San Diego this past weekend. We spent the entire weekend running errands and buying apartment necessities at Ikea, Costco, Target, and Walmart. I adore the gold details on this utility jacket from Forever 21 and was sad that I forgot to put on any accessories when we left the apartment. 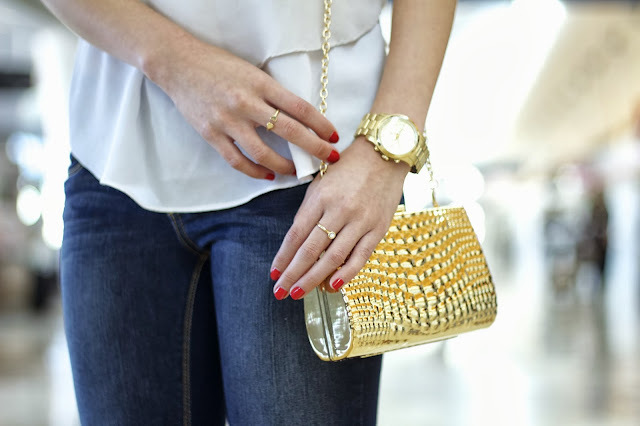 I think gold accessories would of been a nice touch to complete this look, but nonetheless it is a super casual and chic look that is perfect for when you are on the go. Theres only a few more days left to enter into my Polette giveaway, see this blog post for all the details. Steal: Life In Progress Parka Jacket from Forever 21, here. Shirt: Truehitt Marbled Crop Sweater from Nordstrom, here. Steal: Must-Have Cropped Dolman Top from Forever 21, here. Splurge: Truehitt Marbled Crop Sweater from Nordstrom, here. Belt: Vintage Perforated Hip Belt thanks to Linea Pelle, here. Steal: AEO Leather Belt, here. Splurge: Vintage Perforated Hip Belt thanks to Linea Pelle, here. Bag: Venice Crossbody thanks to Linea Pelle, here. Steal: Under One Sky Faux Leather Crossbody from Nordstrom, here. Splurge: Venice Crossbody from Linea Pelle, here. Shoes: Bamboo Senza 01 Chestnut Single Strap High Heels thanks to Lulu's, here. Steal: Bamboo Senza 01 Chestnut Single Strap High Heels from Lulu's, here. Splurge: Aubrey Platform Sandals from Sole Society, here. Hi everyone! I hope you had a nice weekend! I had a short yet busy trip to San Diego, but loved every minute of it. The weather was gorgeous, food was delicious, and I got some pieces from the Philip Lim for Target collection. (yay!) The highlight of my weekend is when I came home to a gift package from I-ELLA and inside was a tulle skirt from Space 46!!!! I have been admiring, wishing, and even considered making one for a few months now and cannot be any more excited about it. Also, if you haven't already, check out my international giveaway with Polette and enter to win a pair of glasses or sunglasses here! Cardigan: Classic Knit Cardigan from Forever 21, here. Steal: Classic Knit Cardigan from Forever 21, here. Splurge: Nubby Knitted Sweater from DailyLook, here. Tank: Black Tank Top from Forever 21, here. Steal: Black Tank Top from Forever 21, here. Splurge: Scoop Back Tank from Nordstrom, here. Jeans: Maya Color Black - Black/Moto Coated thanks to Articles of Society via xPose PR. Steal: Be Seen Faux Leather Leggings from Forever 21, here. 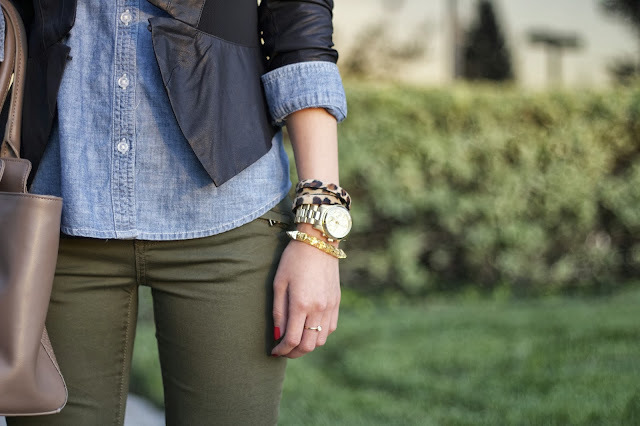 Splurge: May Coated Skinny Jeans by Articles of Society from Nordstrom, here. 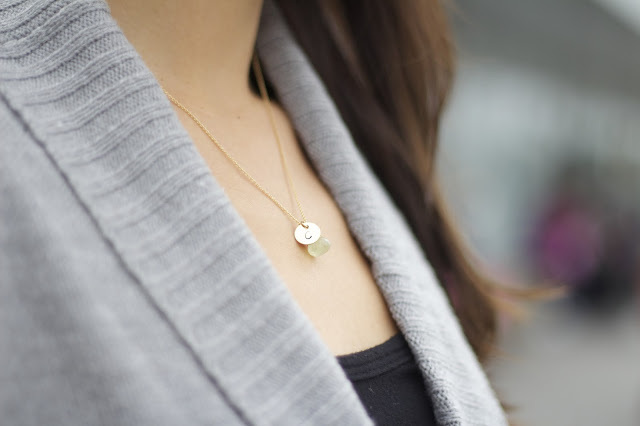 Necklace: Prehnite Solitaire with a Gold Filled Disc thanks to Saressa Designs. Steal: Seafoam Chalcedony Teardrop Necklace from eff.Y.bee, here. Splurge: Prehnite Solitaire thanks to Saressa Designs, here. Bag: Caterina Purse in Black thanks to Cuore and Pelle, here. Steal: Winged Mini Handbag from DailyLook, here. Splurge: Caterina Purse in Black thanks to Cuore and Pelle, here. Shoes: Simple Strap Heels in Black thanks to DailyLook, here. Steal: Simple Strap Heels in Black thanks to DailyLook, here. Splurge: Realove Pump by Steve Madden, here.